Have you ever stopped to wonder what it means to be Christian? Curiously, the term is never used in Scripture. Instead, Christian was a label used by outsiders to define Jesus’ followers. Jesus referenced ‘disciple’ as the key word he used to describe his supporters along with the fact that they would be known for their love – a novel concept for their time – and ours today. 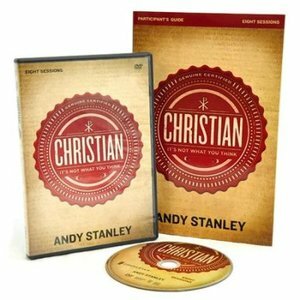 Through eight engaging and enlightening sessions, we will listen to best-selling author and pastor, Andy Stanley, unpack the qualities Jesus prescribes for his followers that made them unique. What if believers today embodied these traits? Would the non-believing world put aside its definition of ‘Christian’ and instead know us by our love? and challenge what you think! "Christian" is a brand that can be good, bad, attractive, or repelling. It's a loaded label no matter whom you ask. But where did the word come from? And did it come with instructions? In this message, we reexamine the word "Christian" and revisit the one thing Jesus wanted his followers to be known for-it may surprise you. The words used to describe Christians today often bear no resemblance to the one word Jesus wanted his followers to be known for. What would it look like if, for one day, we got it right? What if we as Christians embodied this one word? What if our behavior was so consistent with this word that folks around us were drawn to us - and to God. In this message, we are challenged to change the name and reputation of Christianity by becoming a group of followers characterized by this one thing. Without intending to, Christianity won the West. It toppled the Roman Empire. And it did so without raising a sword. What was the secret of the early church's influence? And where did we go wrong? In this message, the secret is revealed- and a lesson for us about judging others. This may be exactly where the church has gone wrong. The early Christians in Rome did not have it easy. They were persecuted, blamed for crimes they didn't commit, even fed to lions. Yet Jesus painted an encouraging picture of their circumstances; he said they were "the salt of the earth," and "the light of the world." While they were simply trying to stay alive, Jesus was saying that they had been strategically placed by God. Could this be true of your life and your circumstances too? This message explains the influence we may not even know we have. The people Jesus loved were messy. The way Jesus loved was messy. He ate with tax collectors and talked with adulterers. His disciples struggled and we still struggle today to understand his extraordinary love. Unwrap the two ingredients that made Jesus' love revolutionary - the secret of the most irresistible message ever preached. Jesus embodied the tension between grace and truth. Churches and Christians should too, but they tend to swing toward one or the other. It's easy to be a church of truth or a church of grace - to be conservative or liberal. But when churches take either of those routes, we can sense that something is wrong, something's missing. Looking for loopholes comes naturally. Whether it's eating all of our vegetables or being home by curfew, no one has to teach us that there is a difference between the letter of the law and the spirit of the law. In a Jewish culture where rules trumped reason, Jesus had a new perspective on rules and loopholes. In this message, we are given a question to ask ourselves when we'd rather look for the loopholes than live as God intends. The person you are has been shaped by those who have loved you and those who have hurt you. Others' behavior toward us has a lasting impact. And Jesus understood this so well that his most urgent command to his disciples was about how they should treat each other. Yet it seems Jesus' concern with how we behave has been distorted over time into a debate about what we believe. In this last message, we return the focus to what Jesus called his "greatest command" - by this everyone will know that we are his disciples.